In the last post I reviewed a report from the World Meteorological Organization; it said that in 2015 the atmospheric concentration of carbon dioxide reached 400 ppm for the first time. The methane and nitric oxide concentrations were 1,845 ppb and 328 ppb. Combined, I calculated that the 3 gases had a radiative forcing equal to 543 ppm CO2e. More recent data from the Mauna Loa Observatory indicates that, since 2015, the atmospheric concentration of carbon dioxide has climbed to 409.65, meaning that the combined radiative forcing is now even higher. But what do these numbers mean? I will try to explain. Most scientists studying climate change have emphasized that it is already too late to avoid its effects entirely – they are already happening. My recent posts on the declining snowpack of the western United States are just one example. I’ve also published numerous posts documenting the increase in temperature in Missouri and other states, the USA as a whole, and the world as a whole. Figure 1. 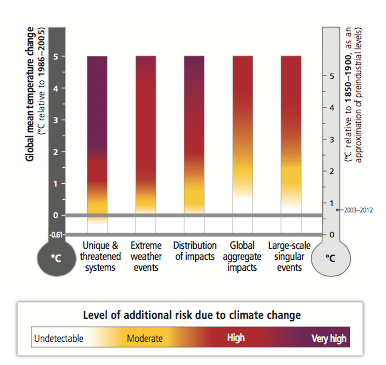 Source: IPCC 2014. Scientists have also emphasized that the effects of climate change will depend on how much the temperature increases. The more the temperature increases, the more severe the effects will be. Figure 1 illustrates the conceptualization. In the chart, each column represents a system that climate change will affect. The 2 y-axis scales represent temperature change, the scale on the left relative to the period from 1986-2000, the one on the right relative to 1850-1900. The color coding of the columns represents the degree of risk that is projected. White and yellow represent less risk, red and purple represent more. There are no cut-off points in this graph, but you can see that as the temperature increases more than 2°C (relative to 1986-2000), the risk grows from moderate to high or very high. How much the temperature will actually increase depends on how high radiative forcing goes, which will depend on the atmospheric concentration of GHGs. Carbon dioxide is the principal GHG. Figure 2. Data source: Earth Systems Research Laboratory 2017b. Figure 2 shows the average annual carbon dioxide concentration measured at the Mauna Loa Observatory from 1959 through 2016 in blue. During the last 10 years, the concentration grew an average of 0.57% each year. In red, Figure 1 projects the carbon dioxide concentration through 2100, assuming that it continues to grow at that rate each year. By 2100, the carbon dioxide concentration will have reached 651 ppm. The future atmospheric concentration of GHGs depends on how much we continue to emit. To study the possibilities, scientists use a series of scenarios that range from sharply reduced emissions, through a middle ground, to very high emissions. They have changed the names they give these scenarios, and now call them RCP2.6, RCP4.5, RCP6, and RCP8.5. RCP6 is associated with a carbon dioxide concentration in 2100 that is similar to the 651 ppm projection I calculated above. 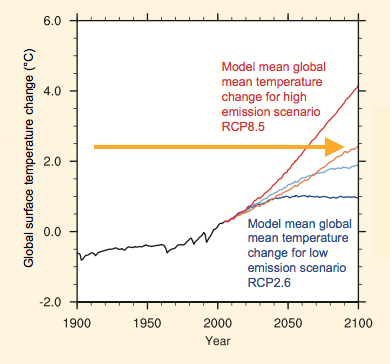 Thus, if emissions continue to grow at the same rate, the earth will approximate the RCP6 scenario. Now, as I noted in the last post, the growth in the atmospheric concentration of carbon dioxide seems to be accelerating. Thus, there is some question regarding whether the earth really is following the RCP6 scenario or something worse. For now, I will stay with RCP6. Figure 3. Projected Temperature Increase Under Four RCP Scenarios. Source: Collins et al, 2013. Okay, now we’ve got what we need to draw some simple conclusions. The atmospheric concentration of carbon dioxide is increasing at a rate that, if it continues, will approximate the RCP6 scenario. That scenario is associated with a temperature increase of about 2°C compared to 1986-2000, and an even higher temperature thereafter. At that temperature increase, unique and sensitive systems will already be experiencing severe risk. And at that temperature increase, the global aggregate risk will grow from medium to high. What does it mean for the health of the planet, and for the health of our species on this planet, that we are following a course that puts unique and vulnerable systems under high risk? It’s already happening, just look around. What does it mean that we are following a course that will cause moderate-to-high aggregate global risk? What will the impacts be, and how will human life be affected? What does it mean for the health of the planet, and for the health of our species on this planet, that the increase in the concentration of carbon dioxide is not decelerating, but continuing to accelerate? The Kyoto Protocol was signed 20 years ago, and it was 11 years ago that climate change burst into widespread consciousness with Al Gore’s An Inconvenient Truth. What does it mean that we have known for so long that we need to address this problem, yet atmospheric GHG concentration growth continues to accelerate? What does it mean that, in the face of these facts, we elected a President who is hostile to the idea of climate change, and he appointed an EPA Administrator who is, also. Even absent our current President and EPA Administrator, have we shown any sign of being willing or able to undertake and accomplish the large-scale changes that will be necessary to address these problems? The reality we face is becoming more dire each day, dear readers. We are passing danger signs like they mean nothing. We will have to live with the consequences for a very long time. Collins, M., R. Knutti, J. Arblaster, J.-L. Dufresne, T. Fichefet, P. Friedlingstein, X. Gao, W.J. Gutowski, T. Johns, G. Krinner, M. Shongwe, C. Tebaldi, A.J. Weaver and M. Wehner, 2013: Long-term Climate Change: Projections, Com- mitments and Irreversibility. In: Climate Change 2013: The Physical Science Basis. Contribution of Working Group I to the Fifth Assessment Report of the Intergovernmental Panel on Climate Change [Stocker, T.F., D. Qin, G.-K. Plattner, M. Tignor, S.K. Allen, J. Boschung, A. Nauels, Y. Xia, V. Bex and P.M. Midgley (eds.)]. Cambridge University Press, Cambridge, United Kingdom and New York, NY, USA. Earth System Research Laboratory. 2017 b. Mauna Loa CO2 Annual Mean Data. Downloaded 2017-06-15 from https://www.esrl.noaa.gov/gmd/ccgg/trends. IPCC 2014: Summary for policymakers. In: Climate Change 2014: Impacts, Adaptation, and Vulnerability. Part A: Global and Sectoral Aspects. Contribution of Working Group II to the Fifth Assessment Report of the Intergovernmental Panel on Climate Change [Field, C.B., V.R. Barros, D.J. Dokken, K.J. Mach, M.D. Mastrandrea, T.E. Bilir, M. Chatterjee, K.L. Ebi, Y.O. Estrada, R.C. Genova, B. Girma, E.S. Kissel, A.N. Levy, S. MacCracken, P.R. Mastrandrea, and L.L. White (eds.)]. Cambridge University Press, Cambridge, United Kingdom and New York, NY, USA, pp. 1-32. World Meteorological Organization. 2016. WMO Greenhouse Gas Bulletin: The State of Greenhouse Gases in the Atmosphere Based on Global Observations through 2015. Number 12, 24 October 2016. Downloaded 6/15/2017 from http://www.wmo.int/pages/prog/arep/gaw/ghg/GHGbulletin.html. By mogreenstats in Climate Change, Greenhouse Gas Emissions on 2017/07/13 . How do we calculate the atmospheric concentration of greenhouse gases in CO2e ppm? I am interested in using the result to compare to a table I saw in Nicholas Stern’s document, “The economics of climate change”. Their web page says that they use a non-dispersive infrared (NDIR) analyzer. 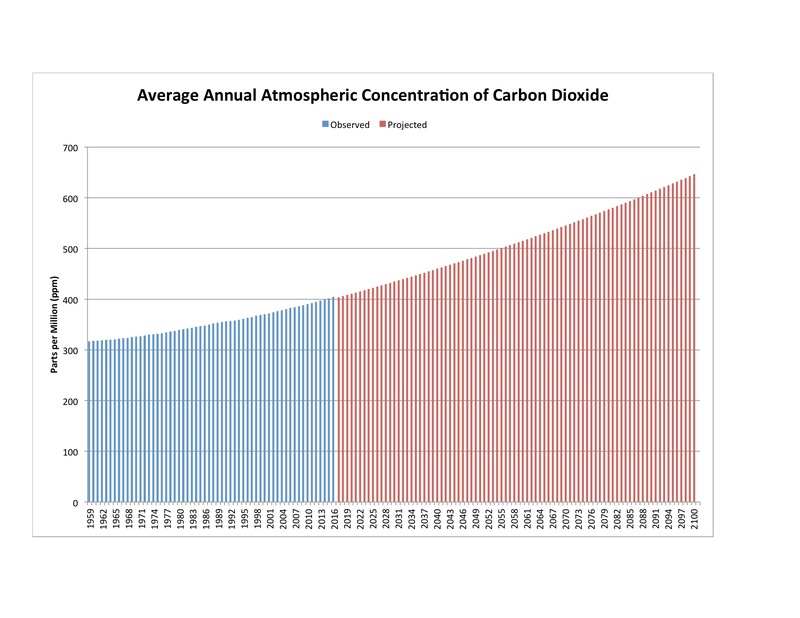 https://www.esrl.noaa.gov/gmd/obop/mlo/programs/esrl/co2/co2.html. Stern’s work is 10+ years old now. You might also want to consult more recent work.